Despite its name, wedding season really knows no season! If there is one thing crisp fall weather calls for, it’s cozy styles with a hint of glam—and dressing up your look is as easy as pumpkin pie! Read on for stylish suggestions to keep you toasty at a fall wedding. Whether it’s an outdoor wedding or you just run cold, coverage is key. Choose a midi or a maxi dress to keep your legs warm; we’re loving wrap silhouettes because of their universal appeal. Feeling extra adventurous? Ditch the dress and go for a pair of slacks with an elevated satin blouse (or a jumpsuit!). If there’s one thing fall gives you total license to do, it’s to play with textured fabrics. Think of anything that delights your senses: velvet, silk and lace are seasonal favorites for elevating your look. Looking for something warmer? Go for a knee-length wool dress, or a cashmere style in a sleek design. 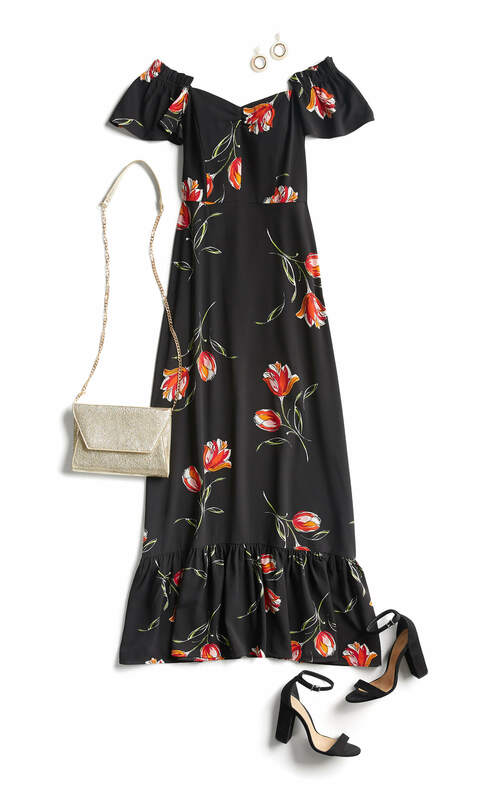 Pro tip: you get extra glam points for embellished details or fall prints like moody florals. Autumnal shades are a sure-fire way of remaining relevant in the cooler months. While navy, plum and burgundy are some of the season’s mainstays, jewel tones like ruby, emerald and sapphire can infuse your palette with more vibrancy; just remember to go with the tones that best suit your complexion! Whether you’re going to be walking on unsteady ground, you’re a comfort seeker or you want to properly prep for the dancefloor, step into a pair of suede wedge pumps, or jazz it up in metallic flats. If your dress is embellished, sprinkle on some minimal metals and voilà! You’re golden. A great jacket or coat can add style and warmth. Opt for a velvet tuxedo jacket with matching slacks, or pop on a faux-fur jacket to amp up the edge. Looking for an easy lightweight layer? Wrap up in a warm cashmere pashmina. Do you need new fall wedding attire? Schedule a Fix to get the perfect fall wedding outfit.